The land that today makes up Francis Field was for many years used partially as a junkyard, and it has seldom been attractive. During the 1930s it became a playground and ball field for African-American residents in what was then the District's segregated recreation system, which existed until May 1954. Until an urban renewal program in 1972, the West End was one of the poorer parts of the District, and partially zoned for light industry. But that agreement did not last, and, as the 1999 photograph at left shows, the field again became a worn-out through overuse and lack of maintenance. FFF had its beginning in as the Francis Field Committee of the condominium board of 2501 M Street, which is now known as the Westgate Condominium. In 2002, during the term of a new DPR director, Neil O. Albert, the field was partially renovated at the request of the Francis Field Committee. The field was closed to organized sports activity for one year to allow newly planted grass to grow. However, that was the last time that any concerted effort was made to restore grass to the field. In 2007, FFF was reorganized, and it made another attempt to improve the field as part of the zoning process for the conversion of two office buildings used by the Bureau of National Affairs into a single luxury apartment building. Working with Advisory Neighborhood Commission 2A, FFF met with DPR officials in March 2007 at the beginning of the administration of Mayor Adrian Fenty. FFF was informed at that time that DPR would be resurfacing the field with its own budget. Therefore, FFF and DPR agreed to seek amenity funds through the zoning process to replace the chain-link fence, plant trees, install benches, trash cans, and a drinking fountain. 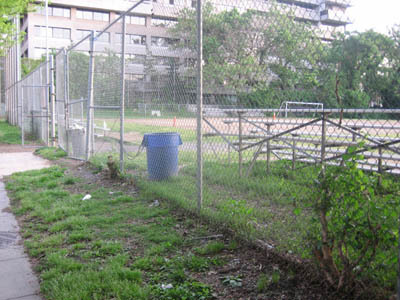 The photo at right shows the architectural fabric of the field at that time, with chain-link fence, plastic trash cans, and a largely bare-dirt field. Beginning in March 2010, the Phase I zoning-case improvements were implemented, at a cost of more than $200,000 to the field, which included a new fence to replace the existing chain-link fence, and streetscape improvements. The photograph at right shows this work in progress. These improvements were paid for entirely by Vornado/Charles E. Smith, the developer of the new apartment building, named WestEnd25, at 1255 25th Street. No tax money was used. While the master plan shows more than 90 trees, 31 were planted with the zoning case funding. No resurfacing of the field was made as part of Phase I, but certainly the master plan contemplates a green grass field, and not the bare dirt condition that exists on a large part of the field today. While Phase II improvements were promised to be completed by "the fall of 2010" by Ximena Hartsock, then the acting director of DPR in a letter of October 2, 2009, to ANC-2A, no further improvements were made during the remainder of the Fenty administration; nor were any made during the four-year term of Mayor Vincent Gray from 2011 to 2015. While the Zoning Case improvements did nothing to remedy the bare-dirt appearance of the central playing area, the architectural fabric of the rest of the field was changed significantly, to one that was more appropriate to the residential neighborhood that the West End was becoming. 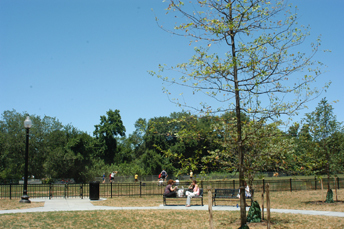 The photo below, taken in July 2010, shows the new fence, benches, trash receptacles, and safety lighting. 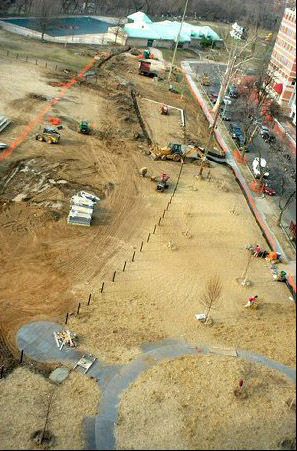 What was referred to as the "prison yard" appearance of Francis Field from 25th Street (as shown in the 2008 photo above) was improved, and park space was provided for passive recreation in addition to the active sports area provided by the central playing field. Not shown in the photo is a drinking fountain, the first ever on the field. These Zoning Case improvements included $150,000 worth of improvements to the field itself, and provided a landscape architectural plan for future improvements to the field. Additional private funds were expended on the streetscape on both sides of 25th Street NW. Not calculated in the value of the improvements were the hundreds of hours of volunteer time contributed by the members of FFF, much of it spent preparing for and attending stakeholder meetings, a neighborhood public meeting, an approval meeting by ANC-2A, meetings with the National Park Service (which owns part of the field, see Ownership article), and two sessions of the U.S. Commission of Fine Arts, which reviewed the master plan first in February 2009, and after considerable review, approved the plan in September 2009. FFF is proud of the improvements delivered and the development of the plan for future improvements. 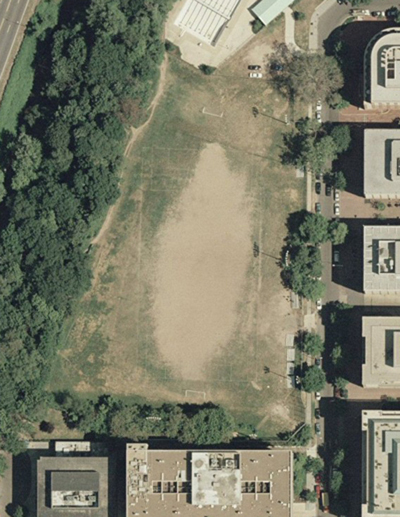 However, the central playing field, which was not improved by the Zoning Case, remains mostly bare dirt and weeds. Fixing that aspect of the field is FFF's major project for 2017.